Even though your parents probably told you otherwise, it can be fun to sin. Someone who knows that well is Vic Sin, a dance, drag, and burlesque performer who produces The Sinner’s Kit Kat Cabaret every month at Bizarre, which is hosted by drag performer (and leader of the inimitable queer drag and burlesque collective Beefsquad) Lee VaLone. It also happens to be Lee’s birthday, so you know the show will be extra special. Helping celebrate (and sin) will be the stacked lineup of C’Etait BonTemps, Angelica Sundae, Devo Monique, Dynasty, Laé D. Boi, Mini Horrorwitz, Nyx Nocturne, and Theydy Bedbug. Get Reel 3: Slumber Party! Williamsburg’s Spectacle Theater, a “community screening space” run by volunteers, typically is a place to find experimental, offbeat cinema on a small screen. However, it’s now also home to a film-themed comedy show hosted by Joe Castle Baker and Max Wittert (“two teens who love teen movies”), in which comedians do live voiceovers while various movie clips are screened. Get Reel certainly isn’t the only show to dip its toes into comedic film voiceover, but Baker and Wittert (along with guests Karolena Theresa, Patti Harrison, Steven Markow, Lucy Cottrell, Carmen Christopher, and Daniel Lempert) bring a certain devilish weirdness to it all that it’ll presumably feel fresh and new. The theme for the show is “slumber party,” so get ready to stay up all night. Or at least until 9, which is when the show will end. Late night shows are usually marked by the presence of at least two things: a major TV network and a white dude hosting in a suit. 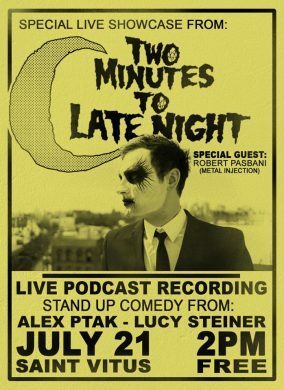 Two Minutes To Late Night has the white guy in a suit thing, but with an added element of KISS-style corpse paint face makeup. Why? It’s not just any late night talk show, it’s a metal-themed late night talk show. Appropriately, there’s also a house band. 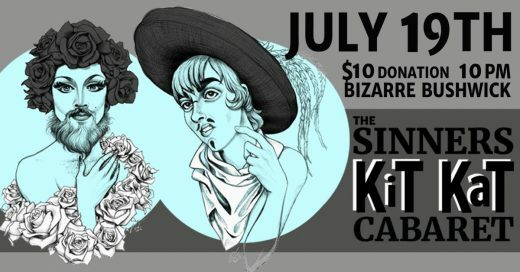 This show at Saint Vitus is their first live comedy showcase outside of their actual late night show, and it’s definitely not late at night. It’s at the sunny time of 2 pm, giving you the chance to get day drunk at a comedy show and then presumably sleep the rest of your day away, because that’s always what I want to do anytime I day drink. The show features standup, a podcast recording, and more. You probably recognize Wallace Shawn from his quotable role in The Princess Diaries, or perhaps as a voice actor in beloved classics like Toy Story or The Incredibles. But Shawn is also a seasoned (and award-winning) playwright as well as a self-identified socialist, penning provocative works that err on the political side of things. (One of his plays was said to be investigated by a vice squad in London in 1977.) One of his earlier plays, Marie and Bruce, is receiving a new production at Clinton Hill’s JACK, produced by comedian John Early and writer/producer Allie Jane Compton, directed by Knud Adams, and starring performer Gordon Landerberger as Bruce (who also did the set design) and Theda Hammel as Marie (a frequent Early collaborator, who also did the sound design). The ensemble is rounded out by a gaggle of comedians and performance artists, such as Lorelei Ramirez and Peter Mills Weiss, making for a new and unexpected take on Shawn’s tale of a woman who decides to leave her husband. « East Village Thai Has Closed After Two Decades	» New Target Desperately Tries to Fit Into the East Village: Does It Hit the Mark?